Thanks to everyone who entered. With a total entry of 107 the trend of reducing numbers has been turned around and made for a successful weekend. Thanks to Richard Gillespie and Stefan Tennant for helping on the friday night at short notice and to Iain, Windsor and Dave Gostelow (late entries) for their help on the Saturday morning and to anyone who helped set up boards tidied up etc during the event. In the Premier Trevor Brotherton shared 2nd place with 3.5 points, In the major Geoff Lee shared 2nd with 4 points. Other entries were John Footner, Dave Gostelow, Iain Wilson, Windsor Peck, Stefan Tennant, Paul Broderick, Roger Brown, Jason Kenderdine, Andy Jones, Richard Gillespie. An excellent turnout from the club. I'm very pleased to report that, despite missing 2 regulars, our A team beat Church Stretton A by 4.5 to 0.5. 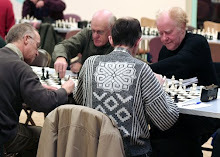 We were helped by our opponents defaulting on board 5 (Sorry, Geoff, for your wasted efforts travelling from work in Shrewsbury to your home near Bridgnorth and back in the fog to Church Stretton). We had no problem fielding a full five, thanks to plenty of volunteers to stand-in (thanks Stefan, Geoff, Windsor and (prior to flu) Gareth). An interesting situation arose in my game against Graham Shepherd. I was a pawn up and with plenty of time in hand when Graham, down to his last 2 minutes, stopped the clocks and claimed a draw, alleging that I would be unable to force a pawn through to Queen and win. In a tournament we would have been able to call upon a controller to watch the rest of the game and decide whether I was making progress towards a win. Without a controller, the best we could do was to note the board position and for me to record moves meticulously. As a bonus, Colin and Steve agreed a draw so that they could observe the game. The game was resumed, with me quickly capturing a second pawn. Graham's flag fell with the arrival of my new Queen only a few moves away and he duly resigned. But what would have happened if such a clearcut position had not been reached? I think it is only a matter of time before a situation like this is referred to the League Controller. In the other match, our 'rookie' D team were away to the 'experienced' Coddon B, the division 3 leaders, and (WAIT FOR IT) won 3.5 - 1.5. Congratulations go to the team, to winners Jason (over George Viszokai), Andy and Neil and to Tim for drawing. 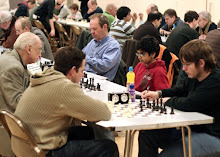 Admittedly there was a certain amount of luck in at least 1 game (Neil's opponent responded to a pawn capture and check by offering his congratulations and resigning before Neil realised that his own Rook could apply mate in one). So the D team potentially move into clear 2nd place. I remember Jamie and others back in September talking about winning promotion in the very first year of existence; I know there is a long way to go, but maybe, just maybe. Don't forget that we close down for Christmas and New Year; the next club night will be on 7th January when our B and C teams play their return match. Also on Wed 17/12, the D team are away to Div 3 table-toppers Coddon B. As the D team have sneaked into 2nd spot, that could be quite a match. Good luck! 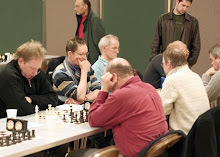 The A team resumed winning ways, beating Coddon A 4-1, with Trevor, John and Stefan winning and Colin and Iain drawing. This match was played a week earlier than originally planned to avoid the Boldmere clash and puts us 2 points clear at the top of division 1. It's been a while since I was in touch; don't want you to get bored! Team Consists of: Trevor Brotherton, John Footner, Dave Gostelow, Glyn Pugh, Colin Roberts, Iain Wilson and Richard Thompson. Richard Thompson performed a Houdini-act last night. He played on in his adjourned game against Lichfield a pawn down. Soon his opponent had swapped off Knight, Bishop and Rook, but he mishandled an ending of opposite-coloured Bishops to end up with a Rook file pawn which could not be promoted. Draw agreed. Brilliant, Richard,as that gave us the match. In the Pittaway Cup match, which finished earlier this evening we beat Warley Quinborne 5-3, with wins from Trevor, Iain, Gareth and Geoff and draws from Glyn Pugh and Colin. A fine result, though they were missing a couple of key players. Unfortunately, Dave has resigned his game against Jana Bellin, meaning that we have lost to Walsall, even if I manage to win my outstanding game.